Thought I would share with you some of my latest haul from iHerb. I am so impressed with this company who deliver to Australia in approx. 8 days and the shipping costs are cheaper than what I can get in Oz. ONE WITH NATURE ROSE PETAL SOAP ~ $3.47 per 200g bar. 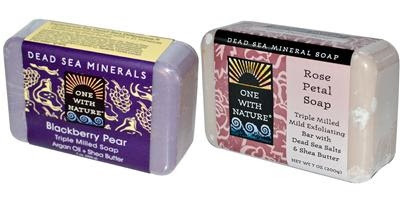 These soaps are made with Dead Sea Minerals and are 100% natural. Contains a vegetable base, dead sea salts, natural fragrance, rose petals, aloe, shea butter and vitamin E. Gorgeous smelling huge bar of soap, mildly exfoliating, super creamy lather and leaves your skin soft and smelling subtly of roses. I liked this soap so much when I first tried it I went back and purchased more as soon as I got out the bath! Available in a variety of fragrances you can find them here. The other bar I purchased was ONE WITH NATURE BLACKBERRY PEAR same great formula and has a wonderful tarte berry aroma. These soaps would have to be the longest lasting soaps I have ever tried. e.l.f. Wrinkle Refiner - clear - $2.99 ~ rich blend of wheat protein, horse chestnut, caffeine, edelweiss, chamomile, shea butter, mango and vitamins A & E, re-texurises skin and prevents further damage and premature ageing. This is like a primer for problem areas that need a bit of extra moisturising, smoothing and plumping. I found it easier to dab a little on and let it soak in prior to foundation, can be used during the day over makeup as needed. Good for those under-eye creases, crows feet and smile lines, I found as it dries it tightens up your skin while leaving it moisturised. iHerb sell a great range of e.l.f. products and you can find them here. 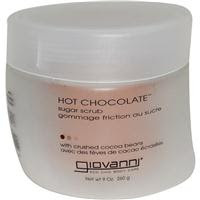 GIOVANNI HOT CHOCOLATE SUGAR SCRUB $8.53 260G ~ if you love chocolate you are going to love this scrub it is just divine. 100% organic contains sugar and crushed cocoa beans, gently exfoliates your skin and leaves the most amazing aroma of chocolate. This one is almost good enough to eat. The price is fantastic and you can find out more about it here. Left my skin feeling smooth and soft with a subtle smell of chocolate. You don't need alot, I would recommend starting with about a teaspoon full and add more as you work around your body. 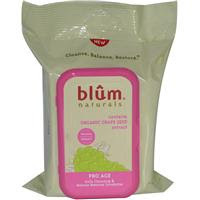 BLUM NATURALS DAILY CLEANSING AND MAKEUP REMOVER TOWELETTES $5.55, 30 thick towels ~ what I like about these cleansing clothes is that they are all natural and use organic ingredients such as grape seed extract, chamomile, aloe, calendula and lemon oil. The towelettes have a raised bumpy surface which helps exfoliate and remove every trace of makeup. I didn't think I would ever find a product to match Wot Not Facial Wipes but these are every bit as good. They don't sting sensitive skin or dry it out, I am really enjoying using these. You can find out more about them here. HURRAW! BALM, NIGHT TREATMENT BLUE CHAMOMILE VANILLA LIP BALM $3.51, this is a repurchase for me. All natural organic lip balm that you can apply at night for a super dose of moisturising goodness but I like to use it during the day too as I have very dry lips from being outside a great deal. Contains Avocado, Argan, Rosehip and Meadowfoam Seed oils in a super thick balm which really stays on and does a wonderful job of moisturising your lips. 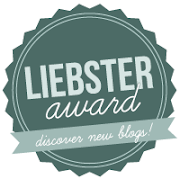 You can find out more here and see their range of lip balms here. 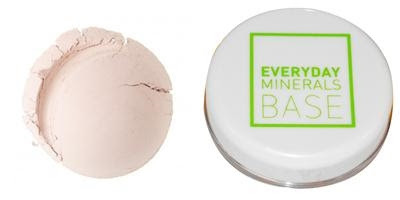 EVERYDAY MINERALS JOJOBA BASE NATURAL IVORY $15.99 ~ I have been a fan of Everyday minerals for many years but stopped using their face products because they became too drying for my skin. I thought I would try the new Jojoba base because I heard it was more moisturising for dry skin, I love it!! I felt no drying at all and I am so excited that I can go back to using mineral face powder again. Everyday Minerals is now available through iHerb and you can find their range of mineral powders and brushes here. I just love iHerb and they offer quick cheap international shipping and I have never had a problem with them so recommend them highly. All their products are high quality and you can find just about anything you need regarding health and beauty, their prices are very competitive and you would be hard pressed to find a better price especially if you are international. Please don't forget to use this discount code TUW872 at the checkout for $5 to $10 off your first order. 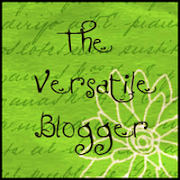 Have you discovered iHerb? Please leave a comment below and let me know what you think. I'm really sorry to hear that ReNu, here is Australia there is a $1000 limit before you get hit with customs duties but we have to be careful what we bring as we have very strict quarantine laws. there are items that can't be imported and customs will just bin them. Not much point purchasing something if it is no cheaper than what you can buy in your own country. Hya Lily, I really like their eyeshadows, if you prefer a more moisturising base you should give the jojoba a go. As for iHerb they have the best prices in products and shipping. Oooo I love the sound of the chocolate scrub! :D Likewise with the Blum Naturals wipes, I am in love with Wotnot so it's great to find an alternative just as good. The scrub is just yummy BUT doesn't taste all that good lol (yes I had to try), I think it probably has some bitter tasting agent in it so you don't eat it and make yourself sick. Leaves your skin feeling so good.